There are many reasons why you should buy Kensun YS-205 Portable Air Compressor Inflator as this model isconsidered to be one of best in the power category of air compressors for its direct drive, durability, robust design and not to mention that it runs smoothly and quietly. The latest 2015 version of the D1001 modellooks aesthetically attractive and performs at the highest standard. Being small size in size, it is easily portable and needs no regular maintenance. You will be more than satisfied with its work. Kensun D1002 AC has various adaptors for its nozzles allowing the compressor to perform a variety of tasks. The new design aside from being rust-free boasts a stronger engine and has a more accurate pressure meter. Kensun offers a one year of warranty and free replacements for any defected parts that assures peace of mind when you buy this product. Athletes who need compressors to you inflate basketballs, footballs, soccer balls and game equipment. I have done reviews for a number of products and Kensun YS-205 (Home 110V)/ DC (12V Car) Portable Air Compressor Tire Inflator is one that deserves a good review. As the latest 2015 version of the D1001 model, it is outstanding for its performance, size and price. 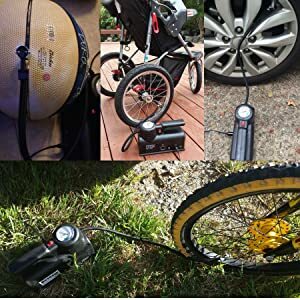 Having 3 nozzle adapters, this air compressor conveniently inflates all types of vehicles from a bicycle to an SUV and up to a caravan. Athletes have ready access to air supply when their sports equipment deflates. We will never be caught flatfooted along the roadside as this highly portable and easy to use Kensun air compressor kit is there in our trunk. Another Kensun is available to make life easier for us all! As the 2015 version of D1001 model, this compressor Kensun D1002 has been tested up to 33 inch tires. It can pump up to 40 PSI with a gauge measures to 250 PSI. Its air flow rate is 11 liter per minute. It is a 3 nozzle adapter air compressor that’s great for all kinds of tires. Price-wise, D1001 model is very low priced and easy to deal with out of the box. Under DC 12V or AC 110V, the compressor can operate through your cars or cigarette lighter or in the wall plug directly anywhere outside of your home. Kensun D1002 comes with triple nozzles that are adaptable for any kind of vehicles and equipment. A led light isinfused in its working mechanism to assist working even in the long dark night. Tested on up to 33 inch tires, it pumps up to 40 PSI (gauge measures to 250 PSI) with air flow at a rate of 11 liters per minute. Long-reaching cord that can stretch up to 3 meters is 9ft 10in (3m) with anAC 6ft 7in (2m) cord plug. The customer service department of Kensun is one of the best where you can ask for and receive a pleasant welcome in replacing the unit with a working one. Its design is not only attractive but sturdy that insures longevity. Being small, it is easily portable to any location and needs only small space for safe keeping. Although compact, its power matches other compressors of bigger sizes. Weighing only 4.7 pounds with a width and height, it is friendly to store in multiple spaces. This is still one of the highest rated units on the market with many satisfied customers attesting to its efficient service. Warranty: Kensun backs all its products with one year of warranty and free replacements for any defected parts. It comes with a Quick Start manual; you just have to follow the simple step by step guide in using this device. For more detailed procedural information, there is a full user manual where you can find all the safety precautions you need to know. Only few compressors can exceed the capability of Kensun aside from its advantage of compactability. In a Kensun YS-205 AC/DC, you can expect a long time service. As one of the top devices in the category of power air compressors, it comes from the prestigious product line of Kensun. Looking at its product features, this device is created to live up to the needs of modern living. There is a direct drive that comes with its own digital gauge. Its attractive features stand equal to its quality standards. Furthermore, you are guaranteed a 100% service and satisfaction! Don’t satisfied with this product? click Best Portable Air Compressor Reviews for Car & Home Use 2016 to find the best product for you! !